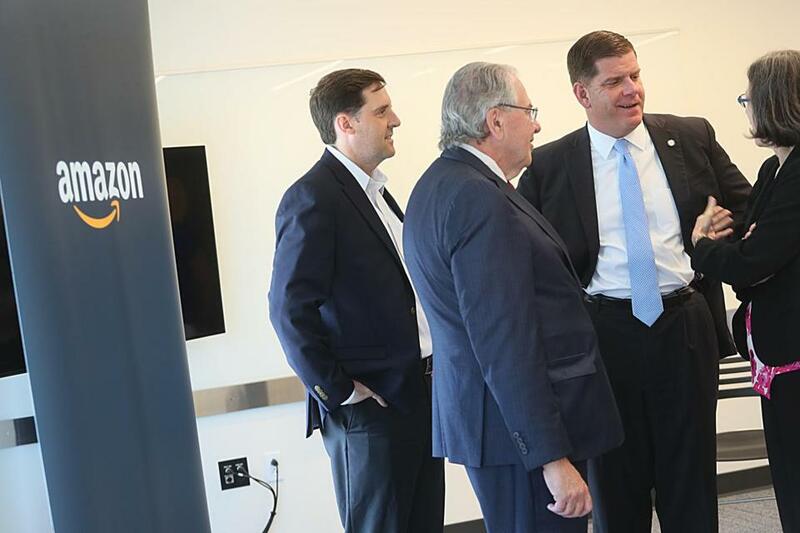 Boston Mayor Martin Walsh and State Representative Jay Livingstone looked at the view to Boston from the Amazon Cambridge offices. Amazon announced plans Monday to keep growing in Boston, saying that it will add 900 jobs at an office opening next spring along Fort Point Channel — next door to the new General Electric headquarters. It’s the latest step in a blistering local growth spurt for the online retail giant, which today has about 1,000 employees in Boston and Cambridge. The added jobs — in one of the city’s hottest office markets — would nearly double the local total of Amazon employees over the coming year. 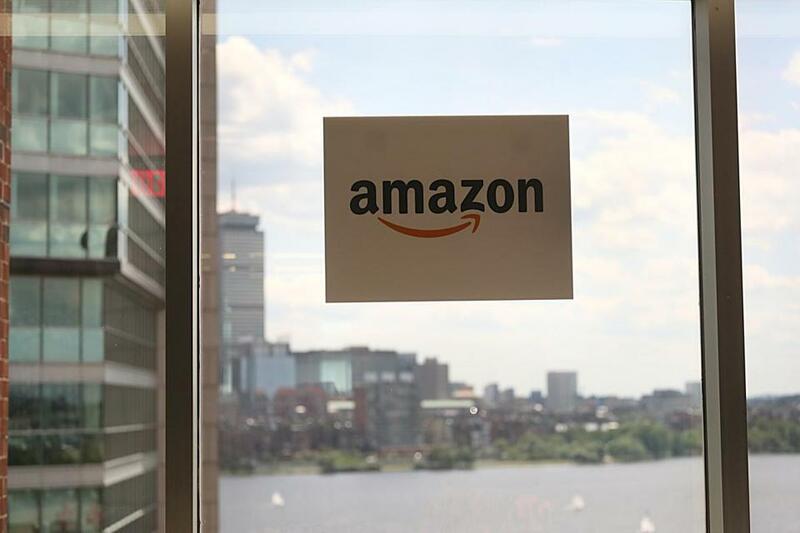 Just five years after the Seattle-based company opened its office in Kendall Square — steps from the Massachusetts Institute of Technology — the Boston area is becoming something of an East Coast hub for Amazon. Hundreds of its engineers in Kendall Square work on voice-operated systems for the Alexa and Audible units, as well as on cloud computing for the company’s Web services. 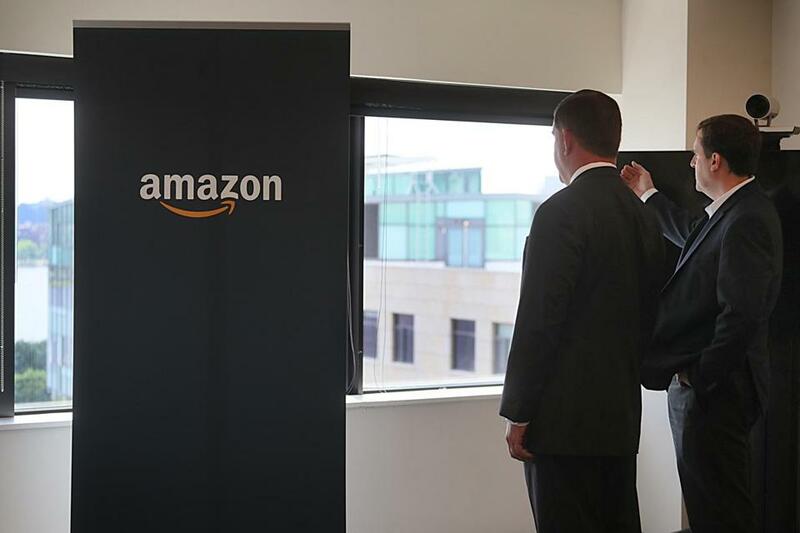 And the region’s young, tech-savvy workforce increasingly is drawing Amazon to recruit here for jobs elsewhere in the sprawling company, said Mike Touloumtzis, who leads the Cambridge office. “It’s just a great market for us to hire in,” said Touloumtzis, a software engineer who grew up in Waltham and Mansfield and moved here from Seattle in 2012 to launch Amazon’s local operations. Since signing a lease in 2013 at 101 Main St. in Kendall Square, Amazon has expanded floor-by-floor up the building and today rents about 171,000 square feet, according to property records. Earlier this year, the company signed a deal to rent most of a new WeWork co-working space in the Back Bay — its first foray across the Charles River. Even as it’s still filling that space, Touloumtzis said, Amazon executives expect that they will need even more. Several months ago, they started looking for a third office in Boston and settled on 253 Summer St., which is across Fort Point Channel from South Station and has been mostly empty since a subsidiary of Partners HealthCare moved out in 2016. Last month, Amazon signed a 10-year lease for about 150,000 square feet — most of the building. The old brick-warehouse district of Fort Point has become a hotbed for tech companies, with a host of small and mid-size startups settling in. And GE has launched work on a $200 million global headquarters it hopes will emphasize its greater focus on technology. Amazon’s proximity to GE was more of a coincidence than part of a business plan, Touloumtzis said. Regardless, the choice of the site is a sign that savvy companies are finding the workers they need in Boston, Mayor Martin J. Walsh said. Amazon is not seeking any tax incentives from the city, he added. For its new headquarters, which is bringing about 800 jobs to Boston, GE received $25 million in city tax breaks and $120 million in state aid for infrastructure. The mayor also noted that Amazon won’t be pulling jobs from someplace else to move to Boston. Its Cambridge office, a short Red Line ride from Fort Point, will remain in growth mode, too, company officials said. “This is about growth,” said Walsh, who made a trip to Cambridge for the announcement. But where that growth might lead Amazon in Greater Boston remains to be seen. In January, it announced plans to add 100,000 jobs companywide by mid-2018. Since then, it has begun opening brick-and-mortar stores, including one in Dedham, and has unveiled a $13.4 billion deal to buy the Whole Foods grocery chain, which has dozens of stores in the area. Last year, Amazon opened a huge distribution center in Fall River, with about 1,000 workers, and it has a growing robotics operation in North Reading. By the time the company’s current expansions in Boston and Cambridge are complete, it will have about 2,000 employees in three offices — prompting some real estate industry observers to wonder if Amazon might eventually consolidate in one big building. That’s a decision for another day, Touloumtzis said. An Amazon sign in the window of the company’s Cambridge offices. “This is a big win,” said Walsh.